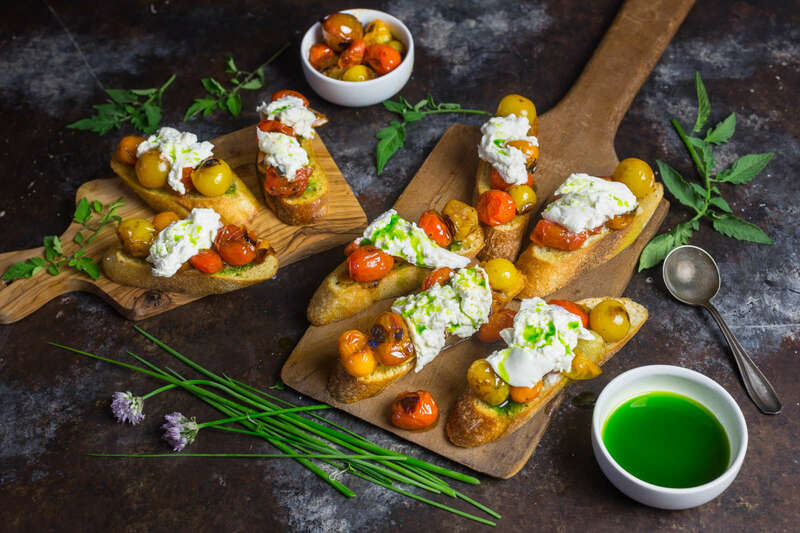 The building blocks of a classic Caprese salad are re-imagined in these summery toasts. First, cherry tomatoes are blistered in a skillet until bursting with juice. Then creamier burrata takes the place of the more standard mozzarella. And in place of basil leaves, a quick and easy chive oil adds an herbal accent. The result makes for a great snack or light meal. When local tomato season begins, we could happily eat nothing else. I can’t recall a summer when we didn’t turn over our lunch almost entirely to slices of crusty peasant bread, thick slices of heirloom tomato, perfectly-ripe and bursting with flavor, a little torn mozzarella, a drizzle of good olive oil, perhaps a few snipped chives or basil leaves, and a sprinkle of flaky sea salt. Like a scent that brings you back to childhood, a good open-faced tomato and mozz evokes a carefree summer’s day. Of course, the key is that the tomatoes have to be at their peak, and most year-round varieties, grown for their ability to be shipped cross-country, just don’t have that essential tomato-ness. 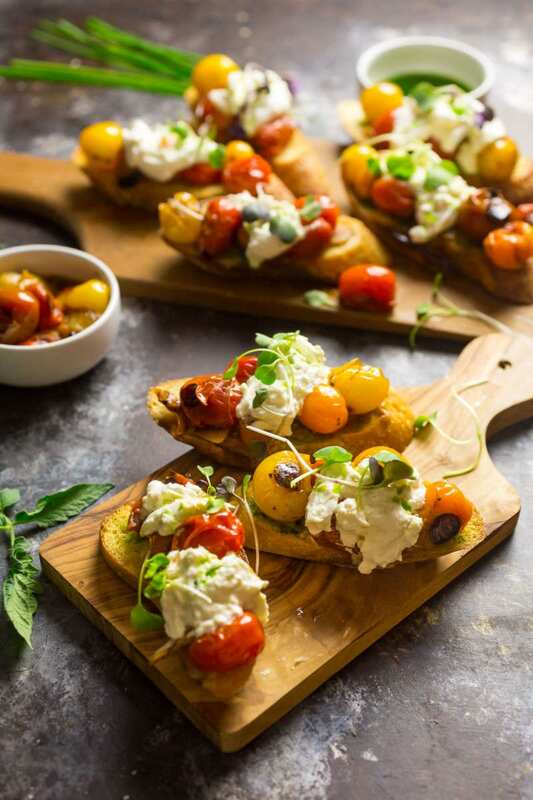 Without losing the essentials of what makes that pairing work so well, we can use the same kind of flavors to add a little sophistication to a light lunch, dinner or party snack. 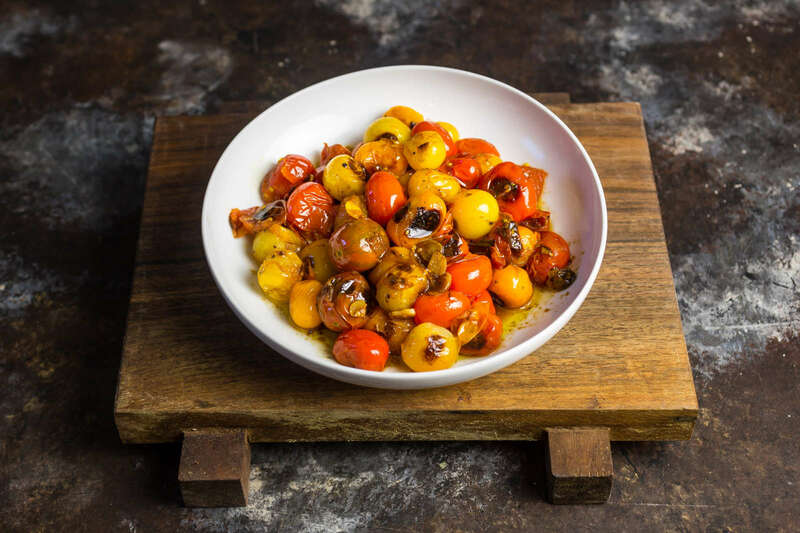 Instead of slicing fresh tomatoes, we toss the cherry variety in a very hot cast iron pan and char them just until they burst with juicy tomato flavor. Turn off the heat and add a little sliced garlic which cooks just enough to take the edge off; instead of mozzarella, we turn to its creamier, more indulgent cousin, burrata; and instead of chopped chives, we make our own chive oil, which gets drizzled over the whole shebang. Note: This recipe is part of our series with Serious Eats. 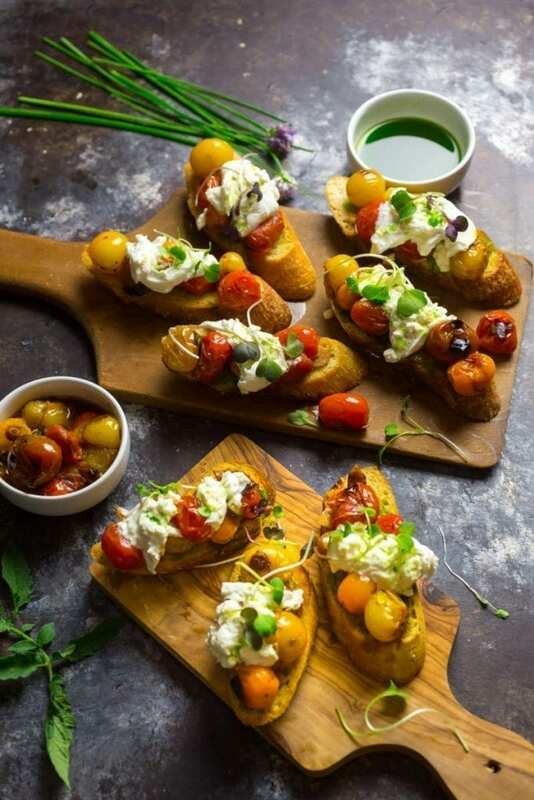 “Crostini” might just mean “little toasts”, but you can pull that definition in a number of different directions once you think of the toast as the delivery mechanism for a range of toppings. 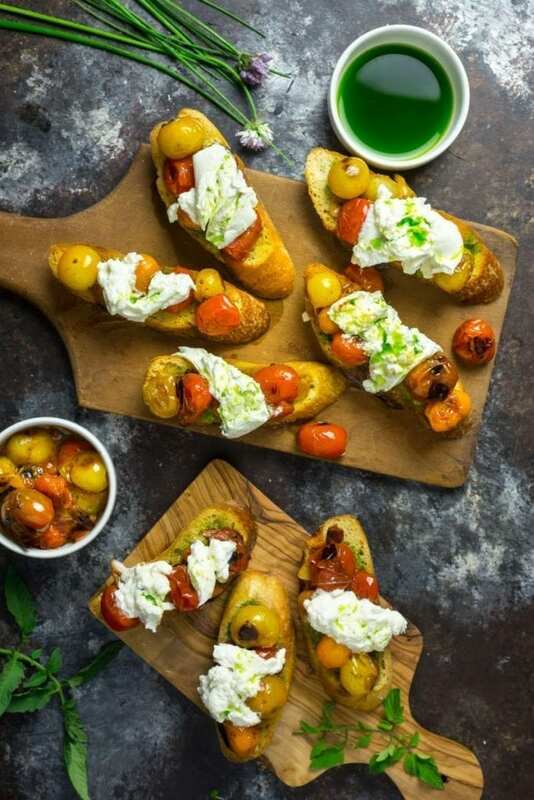 A soft-curd cheese like ricotta, goat’s or cottage cheese is a classic ingredient that gives you a creamy counterpoint to something more assertive like grilled mushrooms, olives or, in this case, charred cherry tomatoes. Regardless of what you put on it, the method for the bread is the same: slice a baguette into half in slices (we like to do this on a sharp angle, both to make the toasts easier to bite, and because they look nicer). Brush a little olive oil on both sides of the bread and lightly toast (or grill) until light brown. We often rub a raw garlic clove on one side of each toast while it’s still warm, but we skipped this step here because we added garlic to the charred tomatoes instead. Cherry tomatoes become sweet and jam-like when blistered and charred. For this dish, skip the large tomatoes altogether and go for the cherry variety, instead. They’re consistently sweeter, juicier, and more flavorful than their beefsteak cousins. 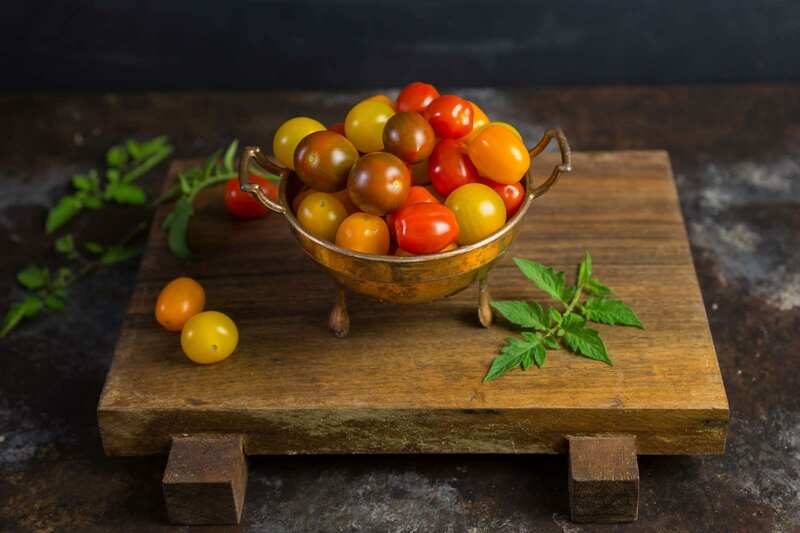 This is partly due to how cherry tomatoes have been bred, but their smaller size also prevents them from crushing one another in transit, allowing farmers to pick them much closer to ripeness. 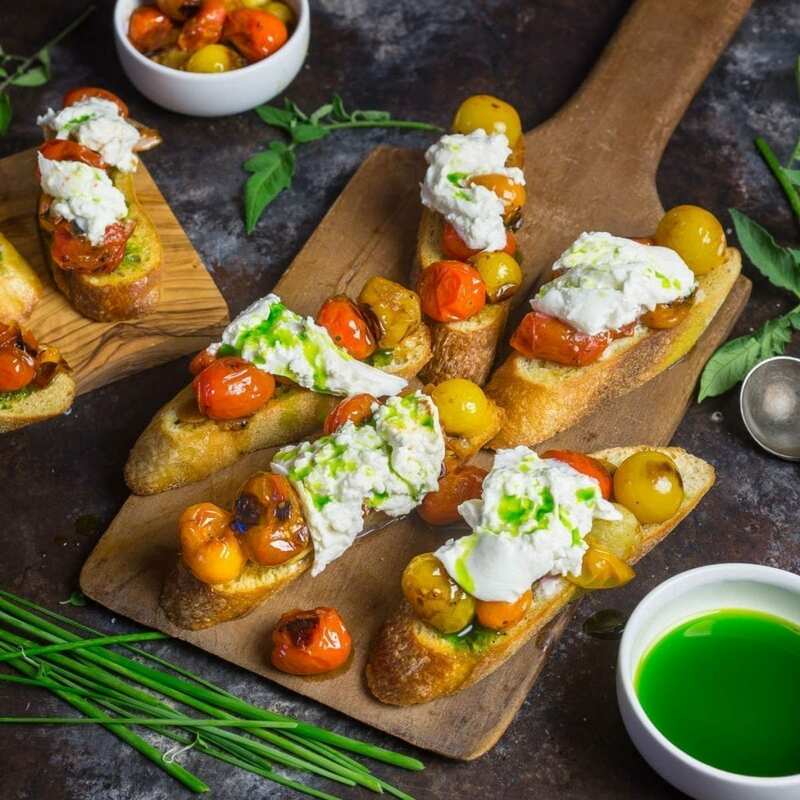 We love using mixed-color tomatoes to make our crostini pop, but you should ultimately pick whatever looks best at your market. Whether or not they’re fresh from your garden, blistering them for just a few minutes in a hot, oiled pan will result in a soft, juicy texture. You’re not looking for them to fall apart completely, just to become jammy and scrumptious. When you add them to the hot pan, let them sit and brown for a minute without moving them much, and then toss a couple of times as you continue to let them brown. This happens fast, 3 to 4 minutes should do it. Once they’re close, turn off the heat and add some slices of fresh garlic, letting the residual heat from the pan cook them. Once they’re ready, season with salt and pepper and remove to a bowl so they don’t continue to cook. Now you can add a splash of good quality extra-virgin olive oil while the tomatoes are still hot. Let’s talk about the burrata. Yes, it’s more than a little indulgent, but that’s really the point. Good-quality burrata is so soft and creamy that you should be able to just tear it with your hands and drape it over the warm tomatoes. We taste-tested a local store-made version, as well as Bel Gioioso brand, and the latter was hands-down the winner, and only a little more expensive. The store version had too much of a firm mozzarella shell for our liking, making it trickier to tear, and didn’t have the homogenous blend of cream and curds you want in the center. The tomatoes can be used warm or room temperature, so if you make them in advance, let them warm a bit before you spoon them on the bread. We finished the crostini with a few drizzles of chive oil – a blend of chopped chives and neutral vegetable oil (olive oil would have overpowered the herb too much), whizzed up in a blender and drained to separate out the solids. If you have a little left over, we think it works really well drizzled over grilled fish, chicken or light pasta dishes. We found some pretty micro greens to lay on top of our crostini, just to up the fancy factor but it’s not at all necessary. This is what we love about summer: take just a few great ingredients, treat them simply but with care and make something really worth toasting to. Preheat oven to 350°F (175°C). Bring a medium pot of water to a full boil and prepare an ice bath. Blanch the chives in boiling water for 1 minute, then transfer to the ice water. Once cold, drain and dry chives as much as possible in paper towels. Put chives in a blender with the canola oil and blend at high speed until completely smooth, about 1 minute. Let stand 15 minutes. Strain into a clean bowl through a fine-mesh strainer (or cheese cloth-lined sieve), pressing gently to extract all the oil; discard solids. Transfer chive oil to a jar or plastic squeeze bottle. The oil can be refrigerated for up to 3 weeks; bring to room temperature before using. In a 10-inch cast iron or other heavy skillet, heat oil over high heat until shimmering. Add tomatoes and cook without stirring until they blister and char on bottom side, about 1 minute. Stir gently and cook until blistered in a few more spots, 1 to 2 minutes longer (they should be blistered and lightly browned in spots, but not falling apart). Remove from heat, add garlic and stir until the tomatoes soften and the garlic is fragrant, about 1 minute (if the pan isn’t hot enough, return to low heat). Season with salt and pepper. Transfer to a bowl, drizzle with fresh olive oil and set aside. Brush both sides of each baguette slice with olive oil. Arrange on a baking sheet and bake for 5 minutes. Flip and cook until toasts are light golden brown, about 3 minutes longer. Top each toast with tomatoes and their juices. 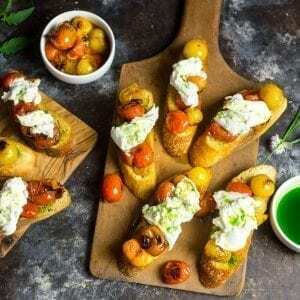 Drape a piece of burrata on top of each toast, then drizzle on chive oil. Season with salt and pepper, and garnish with micro greens or minced chives, if desired.